On behalf of the Bavarian State Office for the Environment and financed by the Bavarian Ministry of the Environment, the scientists analyzed all available fish datasets for the Bavarian catchment areas of the Danube, Elbe and Main rivers over a period of more than 30 years. They compared the current status with the historically derived reference status of the originally occurring species at the respective locations. A new result of the study is also that species such as the "common dace," which were previously regarded as widespread, are also declining compared to the historical reference status. In contrast, those species known as generalists, which demand very little from their habitat, are now propagating even more. 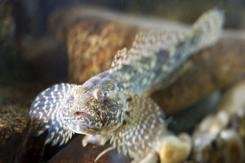 Notable among these species are many non-native fish which were either deliberately imported to Central Europe, such as the rainbow trout or the topmouth gudgeon, or which arrived unintentionally via the ballast water of ships, such as the Pontocaspian goby species. When do invasive species pose a threat?